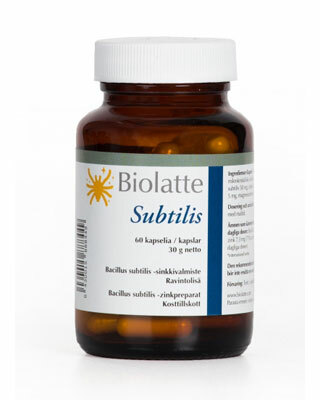 Biolatte Subtilis is a product that contains a patented Bacillus subtilis microbe strain and zinc. Zinc supports normal functioning of the immune system and healthy pH balance as well as contributes to the metabolism of fatty acids. Bulking agents (maltodextrin, microcrystalline cellulose), gelatin, Bacillus subtilis, zinc picolinate, anticaking agents (silicon dioxide, magnesium stearate). 1-2 capsules a day, to be taken with water, with meals. Not recommended for children under 2 years of age. Bacillus subtilis 2,5E9 CFU (or 5E9 CFU), zinc 3,45 mg – 23%* (or 6,9 mg – 46%*). * of the recommended daily intake. Storage: Store at room temperature in a dry, dark place. Keep out of reach of children. Do not exceed the recommended daily dosage. Dietary supplements should not replace the variety of foods important to a healthy diet.